What is a Pre-Mover Score? With SmartTargeting for Enterprise, you can analyze your marketing database or any geographic area to look for top prospects based on SmartZip’s Pre-Mover Score. Next, streamline your sales and marketing efforts through SmartZip’s automated marketing platform to focus on the homeowners scientifically predicted to move within the next six months. We’ll start by using predictive analytics to provide a Pre-Mover Score for every contact in your database or to the homeowners in a selected geographic area. The more likely someone is to sell or move within the next six months, the higher their Pre-Mover Score. You can segment your top prospects based on their scores and allocate your marketing and sales efforts appropriately. Now you have a targeted approach to your marketing campaigns. You can avoid wasting marketing dollars and stop prospecting to people who aren’t interested. Instead, launch targeted multi-channel marketing campaigns to those with the highest moving scores. You’ll benefit from reaching out to homeowners at just the right time, giving you a clear advantage over competing lenders. 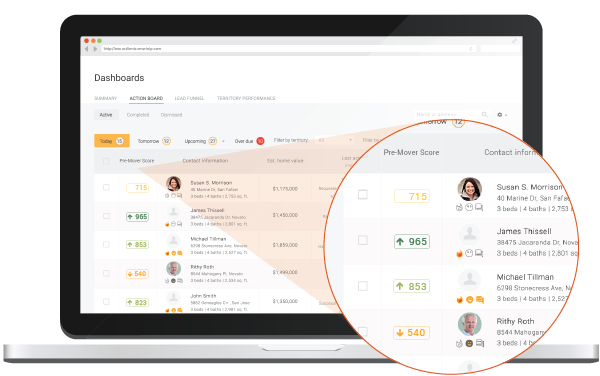 Identify homeowners most likely to move and generate qualified leads with SmartTargeting's pre-mover scores.